Is a Day in Genesis a Thousand Years? But do not forget this one thing, dear friends: With the Lord a day is like a thousand years, and a thousand years are like a day. The Lord is not slow in keeping his promise, as some understand slowness. He is patient with you, not wanting anyone to perish, but everyone to come to repentance (2 Peter 3:8). Scoffers will come in the last days with scoffing, following their own passions and saying, “Where is the promise of his coming? For ever since the fathers fell asleep, all things have continued as they were from the beginning of creation.” They deliberately ignore this fact, that by the word of God heavens existed long ago, and an earth formed out of water and by means of water, through which the world that then existed was deluged with water and perished. But by the same word the heavens and the earth that now exist have been stored up for fire, being kept until the day of judgment and destruction of ungodly men (2 Peter 3:3-7) (emphasis added). These thinkers flatly contradicted the unanimous teaching of the Church Fathers who held, with St. Paul, that “all God’s works were finished from the foundation of the world” (Hebrews 4:3)-after the creation of Adam and Eve-and that God created all of the different kinds of creatures, including man, by a supernatural divine action, in six natural days (the majority view) or in an instant (the minority Augustinian view). Indeed, all of the Fathers would have concurred with the fourth century “Apostolic Constitutions” that the Sabbath was observed “on account of Him who ceased from His work of creation, but ceased not from His work of providence.” Thus, the farthest thing from St. Peter’s mind was to expand the length of the days of creation to allow for a natural development of creatures. 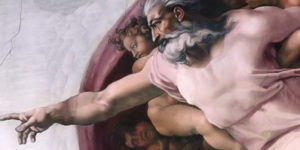 Indeed, St. Peter’s primary point in the third chapter of his second epistle is that creation-like the Second Coming-is a supernatural divine action which “scoffers” will try to reduce to a natural process. God completed the world and this admirable work of nature in the space of six days, as is contained in the secrets of Holy Scripture, and consecrated the seventh day…For there are seven days, by the revolutions of which in order the circles of years are made up…Therefore, since all the works of God were completed in six days, the world must continue in its present state through six ages, that is, six thousand years…For the great day of God is limited by a circle of a thousand years, as the prophet shows, who says, “In Thy sight, O Lord, a thousand years are as one day.” …And as God labored during those six days in creating such great works, so His religion and truth must labor during these six thousand years…(emphasis added). (Institutes 7, 14). In conclusion, 2 Peter 3:8 reinforces the patristic understanding of Creation and the Flood and provides no basis for lengthening the creation period to allow for any kind of natural development of the original kinds of creatures. Just as God produced all of the different kinds of creatures ex nihilo in six natural days and “rested” in His very good creation, so God would work out His purposes in the order of Providence in human history and “rest” in His elect during what St. Irenaeus in Book V of Against Heresies called “the times of the Kingdom.” Tragically, those who “scoff” at the traditional understanding of Creation and the Flood wittingly or unwittingly weaken expectant faith in the Second Coming of Christ, which has always been one of the hallmarks of a vibrant Catholic community.